What does the name “Isis” mean? This is the most common way the name of Isis is written in hieroglyphs. 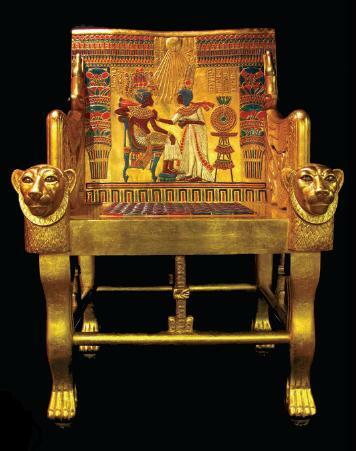 The golden throne found in Tutankhamun's tomb. The Goddess Isis is the Goddess Throne. It is certainly true that Isis was associated with the kingship—as were all the major Deities and most of the minor ones. The living king, seen as the embodiment of the God Horus, was considered the son of Isis (as well as many other Goddesses). After death, the king became an Osiris, so naturally Isis became his mourning widow. As the personification of the royal throne, Isis is the institution of the kingship itself. A feminist interpretation could rightly be that no king could take his place on the throne unless he had a right relationship with the Goddess Throne. To rule, the king must sit in the lap of the Goddess as Her child and husband. To identify Her, the Goddess often wears the hieroglyph for throne on Her head. But to me, defining Isis—arguably the Greatest Goddess of all time—as merely the “royal throne” is the most bloodless and boring of the possible explanations of the meaning of Her name. Interestingly, “throne” isn’t even the most common meaning for the hieroglyph Isis wears on Her head. More generally, iset means seat. The ancient Egyptians seemed to have had a flexible, idiomatic use for the word similar to its use in English. For example, when we say “he is in the seat of power,” we are not often referring to an actual seat, but we mean that he is in charge. Similarly, iset smeter means judgment seat and the term referred to a tribunal of judges. Just as we say we have our heart set (a word that comes from seat) on something, the Egyptian wished for her iset ib—literally the seat of the heart—but meaning her heart’s desire. Even more generally, iset means place. Judging by the uses of it we have left to us, it often means an important or sacred place. Iset Weret is the Great Place, an idiom for Heaven. The iset wabet is the place of purity; that is, the sanctuary. The Iset Maat is the Place of Law or Truth, that is, the Otherworld. Iset neferet is the beautiful place; the cemetery. Iset hotep is the place of peace; the tomb. Temples can be designated as isets, as the special places of the Deities. The Iset en Neit is the Temple of Neith. The Iset Heqit is the Place of the Frog Goddess, Heqit. Egyptologists believe that the coming together of people around the shrines of Deities played an important part in the early organization of Egyptian society. What’s more, the Egyptian term for a settlement was the seat or abode of the Deity—and generally, Egyptian place names are feminine. So iset is a seat, an abode, a tomb, a place, a temple, a chamber—a feminine seat, abode, tomb, place, temple, or chamber. In the Coffin Texts, the Creator God Atum says He was “alone in lassitude” in the Nu, the Primordial Chaos, and describes it as a time “when my throne had not yet been put together that I might sit on it.” Here, the throne is a symbol of everything. With the coming together of the throne is the coming into being of all things. Thus, I believe we can say that the Goddess Throne is the Goddess of Existence. She is the seat not only of the king, but of all things. Without the Throne, nothing exists but the Primordial Chaos and the Divine consciousness. She [a Divine Cow Goddess] leads him [the deceased King] to the Great Throne [Iset Weret], who created the Gods, Who created Horus, Who engendered Thoth. Isis conceives him, Nephthys engenders him. He sits upon the Great Throne, Who creates the Gods. To me, and perhaps to you, dear Isiacs, this is a much more satisfying explanation of the meaning of the name of the Great Goddess Isis, the Great Goddess Throne. She is the Goddess of Existence and She is the One Who is Great of Magic due to the enormous magical power it takes to bring something into being. Isis creates by conceiving something in Her heart/mind, then speaking it into existence with Her magical tongue. Through the holy power of Isis, Something comes from Nothing, Being comes from Non-Being. From the Mysterious Womb of the Mother comes the Holy Child—always, always, as if by magic. Isis worship todayThe name "Isis"
Next Next post: What does the name of Osiris, the Beloved of Isis, mean? What a wonderful post! When I contemplate Isis, I often also get concepts of Wyrd tied into my insights. I’ve felt this was a bit of personal bias, but upon reading this post it doesn’t feel so selfish. How beautiful! I’ve always thought that magic and art—most certainly including music—are some of the key things that make us human…and perhaps divine as well. William W Moore I agree with Simin in that “no king could take his place on the throne unless he had a right relationship with the Goddess Throne.” Isis was the mother of the throne. The entire line of Egyptian royalty began from her womb. It’s a controversial subject, but I still believe that Egypt was a matriarchy in that the throne passed down the female line of inheritance. You couldn’t be Pharaoh unless you had a ‘Daughter of Isis’ queen. The throne came with her, not by birth, not by conquest. I don’t agree that “In Egyptian, the name Isis means throne.” Isis was the Serpent Goddess. She was twice-wise. She was the goddess of double-wisdom. The Sacred Asp of Isis was her wisdom symbol. The Sacred Asp of Isis was also the wisdom symbol for the Soma mystery cult or religion. Isis was the archetype of all things dual. The Isis form of her name is derived from Hiss Hiss, two hisses of the Sacred Asp. Our word hiss, contains her name iss. Our word goddess contains her name ess. The name Essenes contains her name. The Greek word gnosis (knowledge) contains her name. The name Genesis contains her name. Genesis means Genes-of-Isis. Mother Goddess Serpent Goddess Isis was the model for mother goddess Eve who spoke to the serpent in the garden of Eden. Thousands of versions of her name are embedded in words and names in our language(s). In our language, adding (s), the hiss of the asp, to any noun makes two noun(s) – compliments of the Goddess of double-wisdom. When one of my uncles heard what I named my daughter, he tried to convince my now late G-ma that it was a bad name to give a child. I gave my firstborn her name because she was the icebreaker(the first child to survive me being a high risk pregnancy case). Considering the meaning,& story of this name, I’d say it’s a comfort knowing these additional bits of info reconfirms I couldn’t have made a better choice than to name my first of my princesses “ISIS”, one of two blessings that ever came from my womb,& into my life. What a lucky girl to have such a lovely name…and blessings to you and both your daughters! I just gave my daughter “Isis” as one of her middle names. She was born 2 years and 1 day after you published this post. I enjoyed reading this… thank you for adding so much depth and illumination and respect to the subject matter. I love the name Isis & all things Egyptian. I gave myself that as my middle name. I feel such a strong connection to the Mother Goddess. Thank you for your post! Thank you for sharing this great content with us.